Cross. All materials should be blessed before construction. however, any number may be used. jewelers, however, make them in the size of ear rings. After searching for many months I finally broke down and purchased a cross from the traditional Irish-American giftyshop. I took it apart and found the simple secret of the design. The process does wonderful things for busy fingers and is great with story telling! to medium sized rubber bands. the center of to the first straw with the second straw projecting to the right. Snug the inside of the bend right up to the first straw at its center. 4. Grasp the center overlap tightly between thumb and fore-finger. and the second straw. Hold tight. 8. This time the bottom half of the first straw will be projecting upward. 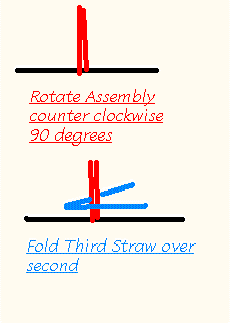 Fold a new straw in half over and across all straws projecting upward. 9. 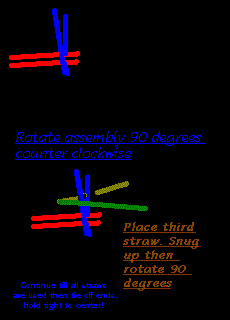 Snug the straw tightly against the center and against the vertical straws. snug up to center and to the right. 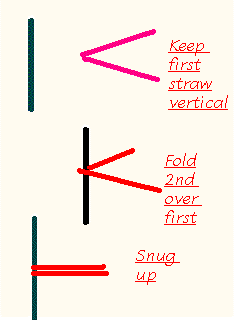 to the left and folding the new straw over until all straws have been used. Remember: Hold tight to the center. careful to hold tight to the last straw folded. wish to seal the rushes when dry with a paint of your choice. This method produces a cross in a form which is much like the Eye of God and as such it brings to mind the antiquity of the Celtic Traditions of Ireland. 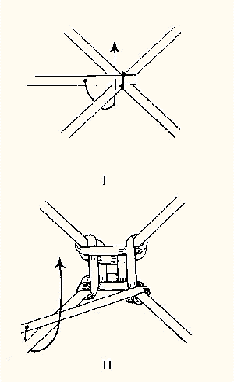 Materials:Two sticks and either rushes or wire or paper twist. Heavy gauge electrical wire (I use green!) makes for a great re-usable cross which can be re-constructed for each session.I start the cross and pass it through the class audience for completion. 1.Secure two sticks together at right angles. (I use string or tape). more Archaic than method 1.